Today’s Thirsty Thursdays comes from Halloween night in Lan Kwai Fong, HONG KONG. OK I know it’s not Halloween tonight, but it’s time to get freaked out Asian Style over a few light ales and skeletons. 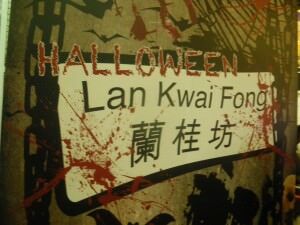 A little unknown tourist gem is that every year on Halloween Night, Hong Kong holds a very special Halloween night. It takes place in Lan Kwai Fong, which is one of Hong Kong’s renowned “pub streets” or “bar districts”. People from all over the world come to dress up and party and the place is packed out! This week’s Thirsty Thursday’s takes us to Hong Kong in Asia! 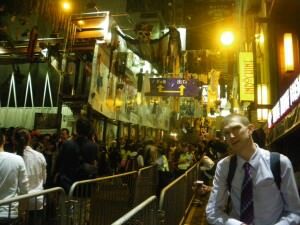 Relaxing in the bright and scary Halloween lights of Lan Kwai Fong in HONG KONG in October 2011. Despite its British roots, Hong Kong doesn’t cite Halloween or even Guy Fawkes night as any kind of special festival or event, and indeed neither is a holiday. But unofficially it’s one of the best places in Asia to be for Halloween. Lots of happy people, all dressed up, colourful and most importantly drinking and partying to the small hours!! I strongly recommend it if you happen to be in or around Hong Kong on the 31st October. 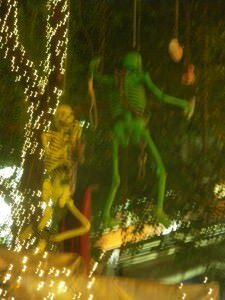 A spooky skeleton hangs down in Lan Kwai Fong’s Halloween Party! The whole street is dressed up for the night. What’s the deal with it? Basically it’s a kind of un-officially organised event (certainly not endorsed by the Hong Kong government) by bars in the area and everyone knows about it!! Word of mouth spreads round that this small part of Hong Kong Island turns into a frenzy of Superman costumes, evil spirits, ghosts and Rilakkumas on one night of the year. All you need to really do is head there and dress up!! Although I knew about the night out, I was sadly busy working on the other side of the city (at New Territories) and when I finally made it over, the party was in full swing and buying an emergency costume amongst the hoardes of crowds wasn’t going to be easy. So I decided to just enjoy it, take some photos, have a few beers and relax! People put a lot of effort into it as do the bars around with their decoration. How shocking that as a backpacker I turned up on Halloween night wearing a shirt and tie! I was probably the least Halloween lookng of the lot. However the term “Gwhylow” is used in Hong Kong to refer to a non-Chinese, white foreigner (slightly racist term I might add) and this kind of translates as “White Ghost” so I ghosted my way into the pub and ordered a pint. 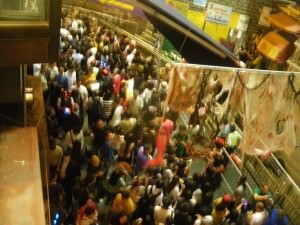 The main street at Lan Kwai Fong on Halloween Night – packed and full of people in fancy dress for a big party. Drinking wise, as far as a Thirsty Thursday goes, this part of Hong Kong is a haven for the booze hounds! There are over 50 bars, restaurants, clubs and pubs in this small area. My favourites are D26, Hong Kong Brew House and the Whiskey Priest. However one with a decent view over the street is Harrington’s, which at the time was called The Dublin Jack (yes it used to be an Irish Pub and the first Irish Pub in Lan Kwai Fong). So I headed to The Dublin Jack (now Harrington’s) for a Guinness and a view over the city. Cocktails followed, all sorts of people came in dressed up and overall it was just a fantastic night. 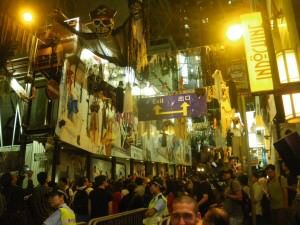 So if you really want a Halloween night with a difference head to Lan Kwai Fong on the 31st October each year (there is also normally a mini-Halloween Night on the Saturday before Halloween in Lan Kwai Fong). Aside from Halloween Night, Hong Kong is EXCELLENT for random nights out and festivals – Hong Kong German Beer Festival and Top 5 Hong Kong Festivals. 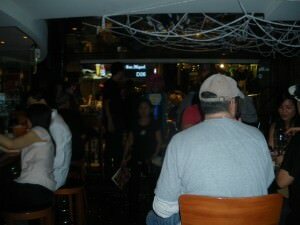 Halloween Night in Lan Kwai Fong is one of my regular Thirsty Thursdays on Don’t Stop Living. It’s a website dedicated to a lifestyle of travel! Top 5 Hong Kong Festivals! This entry was posted in Daily Features, Destinations, Hong Kong, Lan Kwai Fong, Thirsty Thursdays and tagged Asia, Halloween, Halloween Night, HongKong, Lan Kwai Fong, New Territories, Race and ethnicity in the United States Census, Thirsty Thursday. Bookmark the permalink. That looks like a blast! The idea of you standing there in your suit reminded me Only Fools and Horses when Trigger happened to be dressed as a chauffer for the fancy dress party that turned out to be a funeral.